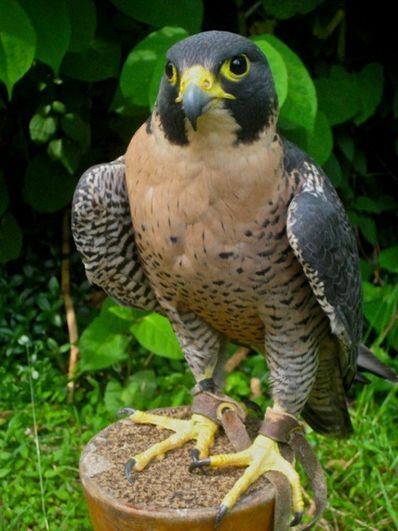 Karma is a female Peregrine Falcon. She is unusual for a number of reasons. She was captured legally from the nest two weeks after hatching by a Washington State Wildlife Biologist/Falconer who had won that opportunity in a lottery sponsored by the U.S. Wildlife authorities. Unlike North Carolina, Washington has a thriving Peregrine population and can afford to have three birds removed from the wild and used for falconry each season. Karma has been featured in falconry magazines because of a dramatic recovery after she went missing as a young bird, and she has been in more than one falconry instructional video.